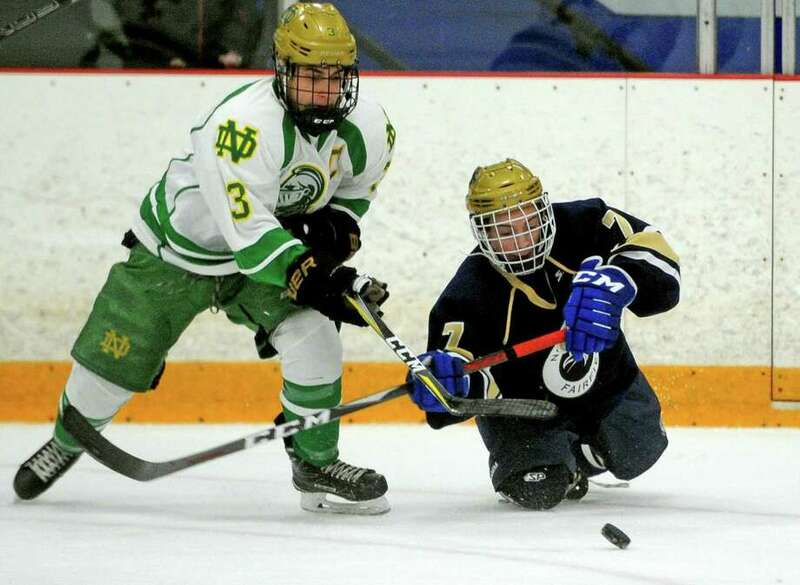 Notre Dame of West Haven's Ian Hayden (3) and Notre Dame of Fairfield's Nate Matrony converge on the puck during boys ice hockey action in West Haven, Conn., on Saturday Dec. 15 2018. At the midpoint of its season, a 9-3 loss to Branford on Jan. 23, North Branford’s boys hockey team had a nothing-special record of 2-7-1 and had lost six in a row. The Thunderbirds wiped that out, at least from their perspective. They won their next two games to creep back toward the CIAC Division II playoff picture. “We’ve got to look at it as a fresh season. We were off to, I thought, a nice little start, told the guys, we’re 2-0, now 2-1,” North Branford coach Ralph Shaw said after Monday’s 4-2 loss to Sheehan. That strayed a bit Monday, but the defeat followed a 4-1 win over Division I Fairfield and a 5-4 win Saturday against Lyman Hall/HK/Coginchaug, one of the top teams in Division III. The Thunderbirds gave Sheehan seven power plays on Monday, and the Titans scored two big power-play goals. North Branford tried to rally on third-period goals by Nick Barrett and Brendan Stoner but fell short. Still, a bit of a trend continued: Sean McKee scored over half of the Thunderbirds’ 33 first-half goals. He has only one of the past 11, and six other players have at least one. GETTING CLOSER: A couple of wins were one sign that things were coming together for Notre Dame-Fairfield. In the Lancers’ visit to the Wonderland of Ice on Saturday, Kacy Adams withstood a barrage from a hot Fairfield Prep team and made 45 saves, though the Jesuits got two in the third to win 3-1. “Kacy kept us in the game the entire night,” Lancers coach John Longo said. “We hit a couple of posts, crossbars, couldn’t get that goal we needed.” A penalty for a Lancer inadvertently playing with a broken stick was costly. So the Lancers are 4-8 going into Wednesday’s visit to No. 3 Northwest Catholic. After Friday’s visit to Prout (R.I.), the last five games of the season will be against teams in this week’s GameTimeCT top 10. Longo sees good habits developing from his players. They’re doing it all with just four defensemen, which isn’t easy anywhere, not least against a tough Division I schedule. SHEPAUG CLICKS: Shepaug co-op coach Mike Gorra knew his team had some talented players. He felt it was a matter of figuring out who fit where, in what roles. He feels like those roles have settled into place, and the Spartans took their first winning streak in four years into Monday’s game, though the streak ended there with a 4-2 Wilton win. Shepaug’s last winning streak was in 2015 on the way to the CIAC Division III semifinals, finishing 12-12 that year after a regular season that included a seven-game winning streak. It had gone 2-69 since then. Shepaug beat Pawling (N.Y.) 6-4 on Friday, and a day later in Danbury, it became the first team to hold JBWA under five goals since opening night with another 6-4 win as junior goalie Alex Thornberg made over 40 saves, Gorra said. Sophomore Jewel Austin got the win in the Pawling game. Colby Fowler, from Nonnewaug, had nine points in those two wins, including a hat trick against Pawling. And among many other contributions, senior defenseman Tucker Redstone has stepped up. Bonino, playing for what was then a pre-co-op, independent Farmington team, scored at 2:32 of double overtime in the 2005 Division II championship game. The 68th goal of his junior year beat Trumbull 5-4.